Pokémon GO EX Raid Pass Changes? 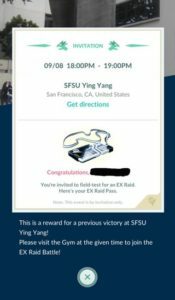 One of the most complained about “features” of Pokémon GO has been the somewhat recent inclusion of the EX Raid Pass Invitation system. That’s saying a lot because if there’s one thing that Pokémon GO players like to do it’s complain. There is a lot to complain about with the game. 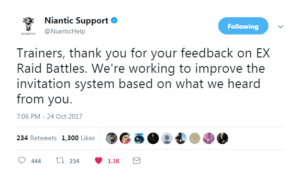 The important thing that I hope Niantic understands is that while a lot of this can be viewed as whining and people being ungrateful we complain because we love the game and we want to see it live up to its potential. This is promising, however, I’d like to see the system just go away. EX Raids have made me actually raid less. I live about 45 minutes from where I work. I used to do a raid or two on my way too and from work, sometimes on my break. I no longer do this. Why? Because my fear is getting a raid pass for my work area on a day off or my home area while I’m at work. Now I only raid around my home in hopes of getting an EX pass there. I also work an erratic schedule so the likelihood of my not being able to participate in a potential EX Raid Battle is fairly high. I also just went on a trip about 1,000 miles away. Of course I didn’t participate in any raids there even though I wanted to as I didn’t want to run the risk of getting an EX pass there either. 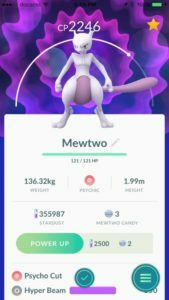 Mewtwo is one of the most coveted Pokémon in Pokémon GO. I know some people who have two or three. I really feel like it would make much more sense to limit it to one per trainer and have a quest involved. Quests are something I’ve wanted to see in the game since day one and even something that Draconius GO seems to have figured out. Here are an example of some potential quest ideas. You could say complete any 5 or any 10 of these. Maybe you’d need to complete all of the quests listed below. This is just me brainstorming about some things that would make me want to keep playing the game and repeating some of the aspects of the game that have gotten quite stale over the last fifteen months or so. After completing all of these a number of things could happen. You could receive a 50km egg and have to walk it to hatch a Mewtwo. You could have to battle Mewtwo a number of times and weaken him to try to catch him. You could have to battle some sort of NPC a number of times then get a Mewtwo. Alternately they could make it much more challenging and have the quest be to catch a Weedle with an excellent throw. After that I think they could just hand you a Mewtwo and you would have earned it.